Note – There is a cheat sheet available for Agile Results — see Cheat Sheet – Agile Results at a Glance. 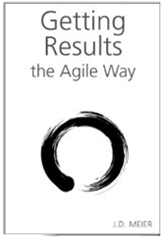 Agile Results is a personal results system for work and life. It’s a simple system optimized around time. It draws from lessons learned and bodies of knowledge in project management, software engineer, and personal development. It’s a collection of principles, patterns, and practices that help you improve your ability to achieve the results you want in your life. Using stories, scenario-driven results, and timeboxing, Agile Results provides the tools to improve your productivity, master your time management, and achieve work-life balance. You get a fresh start each day, each week, each month, each year. The Rule of 3. This is a guideline that helps you prioritize and scope. Rather than bite off more than you can chew, you bite off 3 things. You can use The Rule of 3 at different levels. For example, you can use The Rule of 3 to pick 3 outcomes for the day, the week, the month, and the year. This helps you see the forest from the trees. For example, Your 3 outcomes for the year are a higher level than your 3 outcomes for the month, and your 3 outcomes for the week are a higher-level than your 3 outcomes for the day. Monday Vision, Daily Outcomes, and Friday Reflection. This is a simple time-based pattern. Each week is a fresh start. On Mondays, you think about 3 outcomes you would like for the week. Each day you identify 3 outcomes you would like for the day. On Friday’s, you reflect on lessons learned. On Friday, you ask yourself, what are 3 things going well and what are 3 things that need improvement. This weekly pattern helps you build momentum. Hot Spots. Hot Spots help you map out your results. They are the key levers in the system. They’re your lens to help you focus on what’s important in your life. They can represent areas of opportunity or pain. Hot Spots are your main dashboard. It helps to organize your Hot Spots by work, personal, and life. At a glance, you should be able to quickly see the balls you’re juggling and what’s on your plate. To find your hot spots, simply make a list of the key things that need your time and energy. The goal is to easily answer the question, “what do you want to accomplish?” for each of these key areas. Most importantly you should have scannable outcomes for your hot spots. Scannable outcomes are simply a tickler list of what you want to accomplish. When you know the results you want in your hot spots in your work and personal life, you have a map for your results. Daily Outcomes. Make a new list each day. Identify 3 outcomes for the day. Once simple way to figure this out is to ask, what are the 3 most important things to accomplish today? Having a simple set of 3 outcomes will guide all your activities. It also helps you prioritize as things come in. Weekly Outcomes. Make a new list each week. Identify 3 outcomes for the week. One simple way to figure this out is to ask yourself, if the week was over and this was Friday, what are 3 things you would like to have accomplished? Queues. For thing you can’t accomplish in a single day, you need a place to store your actions and ideas. Make a list for your each activity, project or chunk of work that you’re focused on. This is where you put actions and outcomes that you aren’t working on today, but need to remember. It’s where you store state instead of in your head. Keeping organized lists on paper or electronic helps you organize your thinking and let your mind worry about things other than task lists. Your queues are inputs into your Daily Outcomes and Weekly Outcomes. Action. This frees up your mind and creates one place to look for your actions. Action information can include your daily outcomes, your weekly outcomes, your queues, and scripts. A script is simply a written set of steps to follow to perform a task. Scripts can help with complex activities or when you are trying to build a new habit. It’s easier to follow a script than to have to spend a lot of energy thinking your way through each time. Reference. This frees up your mind and creates on place to look for your reference information. Reference information can include any notes you need or a dumping ground for your ideas. The key is to factor reference from action so that you can quickly scan actions you need to take, or easily scan information you need as inputs. Calendar. Your schedule is how you organize your time. The most important concept is scheduling time for what’s important and then working around that. This includes setting boundaries. You start by setting high-level boundaries. By setting boundaries on your time, you create timeboxes for your results. For example, you might decide that you take weekends off. You might decide on a rule such as “dinner on the table at 5:30” or “in bed by 10:00” or “no work at night.” For example, you might decide that you are willing to spend a maximum of 50 hours a week at your job. You might decide that you spend a minimum of 3 hours a week working out. These high-level boundaries help you manage your energy and pace yourself for results. Another key to your schedule is spending more time on your strengths, and less time on your weaknesses. Some activities give you energy, while others take it away. Think of your energy in terms of your mind, body, and emotions. It’s simple. For any system to stick, simplicity matters. It’s self-correcting and you can course correct throughout the week. You’re in control. All this does it help you make better, rapid decisions about your next best thing to do – at a glance. Using Hot Spots helps you keep the important things in mind. If your lists are scannable, your brain can quickly figure out what matters. If you know your key outcomes, you can make effective trade-offs. If you keep a Daily Outcomes list for action, you can free up your mind for other thoughts. If you use your Daily Outcomes list, you can quickly set your sequence and priorities vs. react or get randomized. Time as a First-Class Citizen. In Agile Results, time is a first-class citizen. Windows of opportunity are important. It’s about doing “good enough” for now, and versioning your results. Time changes what’s important. What was important last month or last week, might not be what’s important now. That’s the agility part. You need to be responsive to what’s important now. This also includes using timeboxes effectively. For example, rather than try to figure out how long something might take, start by figuring out how much time you want to invest in it. Identify up front, at what point is it diminishing return. This will help you cut your losses and figure out how to optimize your time. Fresh Start. If you fall off the horse, you can get back on. You get a fresh start each day, each week, each month, each year. What you take on is just as important as what you let go or “slough off.” You don’t want to be a beast of burden where one more straw breaks your back. It’s about thinking in terms of delivering value over simply working through your backlog or crossing off To-Dos. It’s about asking and answering what’s your next best thing to do. Tests for Success. Your tests for success answer the question, “what will good look like?” Simply by figuring out the 3 outcomes you want for the day, the week, the month and the year, you identify your tests for success. You have an idea of what you want to accomplish and what good will look like. Knowing your tests for success helps you prioritize. 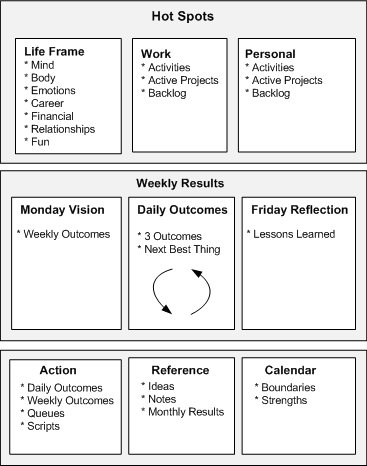 Outcomes Over Activities. Outcomes provide a lens for focus. Outcomes are the results you want to accomplish. Just doing more activities and throwing more time and energy at problems won’t necessarily produce the results you want. By starting with outcomes, you define what good will look like and you give yourself a compelling path to work towards. Working on the right things to produce the right results for your current situation is a recipe for success. Approach Over Results. How you accomplish your results is more important than the results themselves in the long run. Your approach is your foundation. It’s what you fall back on when you don’t know the way forward. Your approach should be sustainable. You should also be able to improve your approach over time. Your approach should be consistent with your values. Your approach should play to your strengths and limit your weaknesses. The Rhythm of Results. Iterate on your results. Version your results over time. The rhythm of results is your daily, weekly, monthly, and yearly results. This is about flowing value incrementally. Think of it as a set of trains that leave the station. If you miss a train, you can catch the next one. At the same time, you want to catch certain trains because of your time frames and windows of opportunity. Strengths Over Weaknesses. Rather than spend all your time improving your weaknesses, spend your time playing to your strengths. While it’s important to reduce your liabilities, you’ll go further, have more passion, and produce more effective results by spending more time in your strengths. In areas that you are weak, one of your best moves is to partner or team up with others that supplement you. If you can’t outsource your weaknesses, you can find more effective mentors or pair up with other people that help you amplify your results. Teamwork is the name of the game and remember that one person’s weakness is another person’s strength. Also remember that your strengths are a valuable asset for yourself and others. It’s a skills-for-hire economy. System Over Ad-Hoc. When you have routines for how you produce results, you can learn and improve. It’s one thing to produce results randomly, while it’s another to have a system you can count on. When you have a system, you can tune and prune what works for you.